Pseudo-Force Centrifugal | THERMO Spoken Here! A caution of physics texts about usage of Newton's 2nd Law is: "Be sure to use a non-acccelerating, that is inertial coordinate reference." However, after that state­ment, through numerous examples next to nothing further is said or done regarding inertial coordinate reference selection. The examples, being in an Earth environment, does text disregard of reference imply all places on Earth are inertial? A "certified mass" is used to calibrated a spring scale at the North Pole. North Pole Event: The discussion below is a comparison of two "weighing events" on Earth. Each weighing by the same spring scale is assumed to be in inerial coordinates. To keep things clear a first step, Figure 1 is a setup. 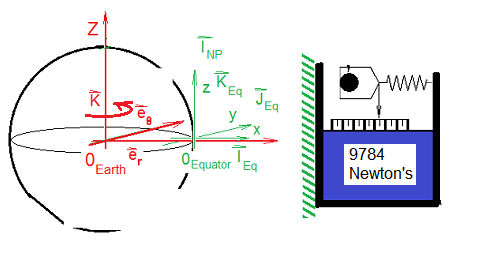 In Figure 1: Earth is represented as a rotating "upright" sphere. 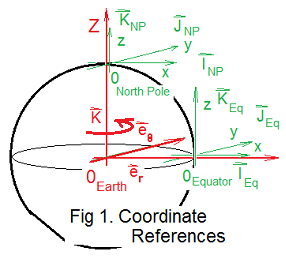 Earth Coordinates rotate with Earth but the "North Pole" coordinate set does not to rotate. Establish Mass: System mass is established using a standard (1000kg) and a beam balance. Establish Force Scale: At the North Pole, a spring scale is calibrated while supporting the system mass. Equator Event: Figure 2(a) depicts Earth with coordinates at the Earth center and Equator (Earth surface)coordinates. Figure 2(b) shows the (NP calibrated) spring scale supporting the system mass, 1000kg. The scale reading is 9874 Newtons. Reference Types: Perhaps there are three references. Actual: Virtually all matter of the expanding Universe accelerates or moves in a spiral. 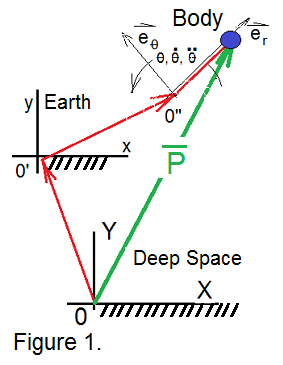 No precise, physically actual "inertial" point is known. None of these places, no location meets the requirements, qualifies as a Newtonian reference. To apply Newton's 2nd Law, texts advise the coordinate axes chosen must be "inertial." These coordinate axes might be thought to describe a place, property "where you would stand" to observe the event of the Body, in that space. Inertial means the coordinates (where you stand) do not accelerate or rotate. This seems critically important. So, one thinks, "The answer is; sometimes no, sometimes yes. 1) Location ~ North Pole (assume fixed coordinates): A mass, "certified 1000kg," is used to establish system mass of 1000kg. Next, our mass, (system) is used to calibrate a spring scale. A mark, 9,810 Newtons is made for support of the a Spring Scale. About Coordinates: By way of simplification (with no harm to our results) we picture spherical Earth rotating in an upright alignment with the North Pole uppermost. Figure 1. shows Earth at an instant in time. Three coordinate references are drawn. Earth-Rotating: The origin of this orthogonal set is located at the center of Earth. The unit vector, K, coincides with the axis of rotation. The time-dependent unit vectors, er(t) and eθ(t) rotate in a plane of the Equator. Rotation of the pair, seen from above, is "counter-clockwise." begin with a rather elaborate set of coordinate systems all in the same plane as shown - Fig 1. Coordinates 0XY: Somewhere beyond the solar system, beyond the Milky way, we assume there is a location 0 that moves with constant (possibly the constant zero) velocity. Further we suppose a set of orthogonal coordinate axes attached to the point has no rotation. That reference out there is called "inertial" and denoted by /////. Dynamical behaviors observed from 0XY need not be described by "pseudo-forces." Coordinates 0'xy: Earth is often assumed inertial; it is not. However observations of dynamical events having short duration or long duration but short distance are immune to the Earth non-inertial effect. I think in your first paragraph you could better state your position as: "It makes a difference if the observer is standing in a reference frame that is itself accelerating (i.e. non-inertial). A specific example is if when the reference frame is the surface of the Earth, which is rotating, and so requires introduction of pseudo-forces such as centrifugal and Coriolis forces in order to get Newtonian mechanics to work in that reference frame." Also, an inertial reference frame does not have to be so far out there in deep space as you describe. I think for your purposes an inertial reference frame can be defined as one that is not accelerating. By Einstein's general theory of relativity it also means a reference frame must not be subject to a gravitational field, but I suspect that your analysis isn't going to explore the implications of gravity on a reference frame. Usage of pseudo or fictional forces amount to applied mathematics transformations, performed on a system to achieve a desired result, notably to reduce the analysis of a dynamic system to the ananlysis of a static or equilibrium system. Similar transformations occur with linear vectors, circular motion and central forces. This of course is the transformation of reversing the resultant of a system of (linear) vectors and calling it the 'equilibrant'.